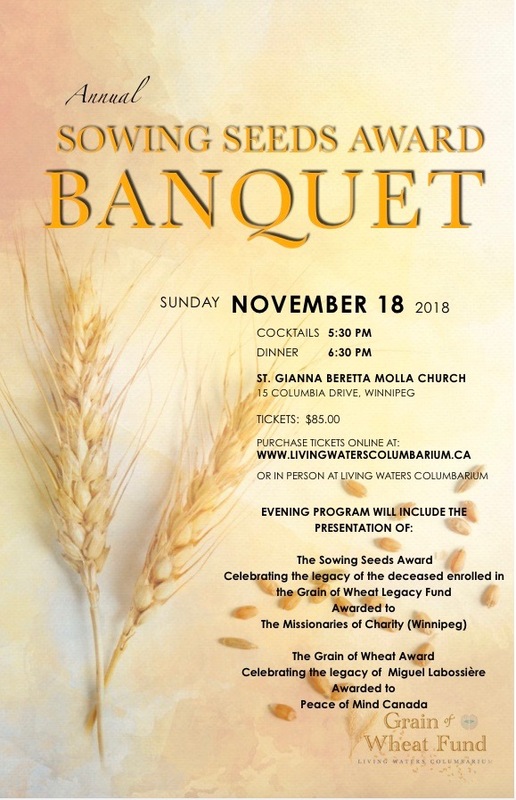 On Sunday, November 18, 2018, we will celebrate our Sowing Seeds Award recipient, and our Grain of Wheat Award recipient. Both awards are made possible through the Grain of Wheat Legacy Fund. Unveiled in 2017, the fund serves as a perpetual memorial for the beloved dead, by supporting groups/organizations that endeavour to transform the world. Each year, a portion of the fund is designated for the Sowing Seeds Award and the Grain of Wheat Award, monetary gifts to support the continued initiatives of organizations selected through a nomination process. The work carried out by the recipients reflects something of the deceased, either the charitable works they passionately embraced in life, or the circumstances of their death that now give way to new opportunities. This acknowledgment is a tangible sign of the great proclamation of our faith in the Resurrection of Jesus Christ – that through the darkness of death, new life is made possible. Those entombed or memorialized in Living Waters Columbarium are automatically enrolled in the fund, and deceased family members and friends who are buried or entombed elsewhere can also be enrolled.The enrolment process can be completed online or in person at Living Waters Columbarium.